Gail Choy-Kaleiki was fishing with her father, legendary Capt. Cornelius Choy on the COREENE-C when they hooked a 1,805-lb Pacific blue marlin. It is the largest blue marlin ever caught on a rod and reel and is not an IGFA world record because they were assisted by other persons in landing the monster. 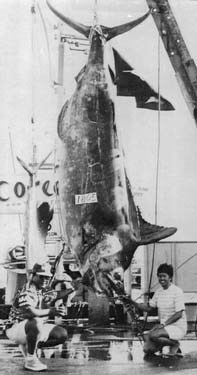 The fish was caught off the island of O'ahu on June 6, 1970. The boat still charters today from Pearl Harbor on O'ahu.